Magic is a vast landscape, consisting of a multitude of stories, game pieces, and ways to interact with the hobby. It is virtually impossible for any one person or company to keep their finger on the pulse of every single trend in the game. When it comes specifically to following singles prices, staying on top of the market is a fool’s errand. As soon as you learn the value of cards, they inevitably change. Being that this is a finance-based site, my focus this week will be on three different trends I’ve observed that strike me as a bit odd. They may have catalysts that provide a rational explanation, but I’ll attempt to present an argument as to why I think these observations don’t make sense. I wonder if these oddities are occurring because people are hyper-focused on their own strategies. Maybe people aren’t looking deeply enough into the past, or broadly enough at current prices and offerings. After all, if we don’t learn from the past, we are doomed to repeat it, right? Last week I flagged the recent price appreciation of Mana Crypt. The Eternal Masters version has gone from $140 to $190 since 2019 (TCG market pricing). The readily available supply of the card has also dwindled. As of Sunday morning, there were 23 sellers with English copies of this card in stock on TCGplayer. One moderately played copy is listed at $179—the next cheapest is near mint and $194.99. Once the cheapest ten copies sell, this will be a $225 card. This card is a major Commander staple that can slot into any deck. It appears in over 28,000 lists on EDH REC. This card is the real deal, so it’s no wonder its price has been rallying aggressively of late. Eternal Masters has gotten old enough that its impact on the market supply is diminishing. No surprises here. Now onto the part that confuses me. At this point, the relative pricing of the different versions of Mana Crypt are perplexing. For example, if you’re fine with playing the original Book Promo version of Mana Crypt, you can obtain an English copy for $165.30 (moderately played). Ignoring the seller with 0 feedback on TCGplayer, lightly played copies start in the $180’s. Okay, so Card Kingdom charges more for the Book Promo than the Eternal Masters version. I’d expect their buylist to reflect this trend. Yet, as of this morning, it does not. They pay $165 on EMA copies and $150 on Book Promo copies. So they pay more for the version they sell for less. That makes no sense too! The last thing that confuses me about Mana Crypt involves the Masterpiece version. Since its printing, the Masterpiece version of Mana Crypt has been much more expensive than any other version. But the premium has slowly been evaporating. Since January 1, the market price on this version of Mana Crypt has gone from $300 to $323. That’s a much smaller increase than the EMA version! At the end of 2018, the Masterpiece version cost 2.1x the Eternal Masters version. Today that premium is at 1.7x and closing. Card Kingdom offers $200 on the Masterpiece version but $165 on EMA copies—that’s hardly a premium at all! This trend also makes no sense and something has to change. My prediction: the Masterpiece version ticks up a notch. Until then, the trend is just bizarre. I’ve written at length about how strange I find ABUGames’s current business strategy. Their aggressive move towards any and all Alpha, Beta, and Unlimited cards may pay out in the long term, but for now it is perplexing. They offer such a huge premium in store credit on these cards, while not nearly reflecting that same premium on newer cards. But that’s not the strangest thing. The thing that really confuses me about ABUGames is the fact that they sell many of these Alpha, Beta, and Unlimited cards on eBay for far less than on their website. I understand this is a way for them to maintain sufficient cash flow, but the practice leads to trends that don’t add up. Consider this: last Friday I was the only bidder on an auction of theirs for a played Beta Mana Flare. I bid on the card after watching the same card listed at auction the week prior fail to receive any bids. At the time the card was listed a few bucks higher—clearly after failing to sell, ABUGames relisted the card on eBay with a lower price point. This is a practice they’ve been implementing quite a bit lately. If I hadn’t bid on this card, I suspect it would have dropped a couple more bucks even still. Why did I decide to bid anyway? Because of the craziness that is ABUGames’s pricing strategy. With shipping I paid $211.92 for this Beta Mana Flare. Humor me for a second and check out what ABUGames offers in store credit for this card. The number is $415—nearly double what they sold it for! You can probably predict what I’m going to do next. Once the card arrives, I’m going to submit a buylist order and ship it right back to ABUGames for $415 in store credit (unless they change their credit price in the interim). With this credit I can shop around for some fairly priced, played Modern staples. 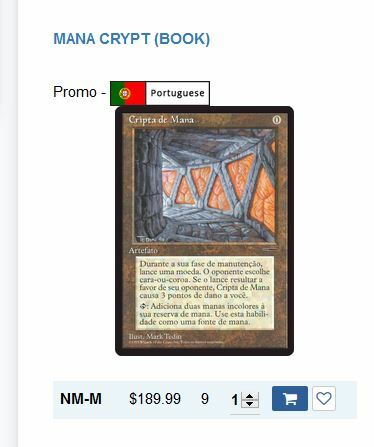 Or I could pick up a couple Portuguese Book Promo Mana Crypts because, at this point, they’re actually priced fairly. If you look at their eBay listings, I suspect you will be able to find other opportunities to get ABUGames credit at half price simply by buying cards from ABUGames themselves. This morning I noticed Leveler was the top mover overnight according to MTG Stocks. The card went from $0.75 to $9 in a few short days. This buyout was triggered by the spoiling of Jace, Wielder of Mysteries. The former wipes out your library and the latter lets you win the game if you try to draw from an empty library. A match made in heaven. This version of Jace also catalyzed the buyout of Thought Lash. It seems a bunch of cards are spiking because of their potential interaction with Jace. This makes perfect sense, and we often see folks jump on the bandwagon when a new combo emerges. Here’s what confuses me. Take a look at that Leveler price chart above. Notice how the card has been essentially bulk for years, but back in 2013 was higher and in the process of a gradual decline? Winning with an empty library isn’t a new concept. Back in 2011, people went wild over Leveler, Divining Witch, and Paradigm Shift. Now there’s another card that does the same thing, and people are going crazy all over again. This is the part that causes me to scratch my head. I was around doing MTG finance in 2011. I even bought a bunch of Paradigm Shifts and Divining Witches, only to get burnt by them. I couldn’t flip them fast enough, and I was left holding a small stack of $0.10 rares. Now I’m seeing the same buyouts occur a second time. I bet some people are even going to make a big profit flipping these cards. My advice: don’t bother. If you didn’t already have copies in hand, you’re likely going to have a tough time flipping these for worthwhile profits. Just like Leveler did from 2012 until 2018, you’ll see these cards drop right back down in price all over again. 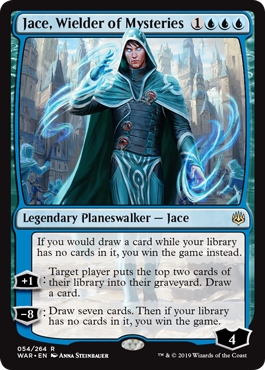 History is going to repeat itself unless this Jace gives the “empty library” deck redundancy it needs to suddenly break into Modern or Legacy. I don’t think it’s a stretch for me to predict that won’t happen. It’s impossible to stay on top of every trend in Magic. With new cards coming at us all the time, reprints on the horizon, and a seemingly limitless set of options for buying and selling cards, you can’t know the pricing trend on every card all the time. If enough people overlook something, it can appear quite odd to the alert observer. This week I wanted to share three distinct trends that screamed “strange” to me. ABUGames’s business strategy has me buying cards from them with the sole intent of selling them right back. Then there’s Mana Crypt’s spike—apparently a privilege saved only for Eternal Masters copies. Lastly there’s the repeated buyouts of horrible Magic cards that empty your library. Each of these trends leave me scratching my head. But you know what? We don’t have to understand these trends to take advantage of them. Now that everyone’s aware, I encourage you to act accordingly until the oddity is no longer present. By then, I’m sure there will be three more counterintuitive trends to take their place! Card Kingdom’s buylist has finally cooled down on Dual Lands. For a while they were getting quite aggressive. Instead, I noticed they’ve been warming up to Jace, the Mind Sculptor. This card keeps climbing in price and Card Kingdom’s buylist reflects the trend. They’re offering $90 for the Worldwake version. And while they only pay $80 on the other nonfoil versions, I suspect this to bump higher soon enough. There are a ton of foils on Card Kingdom’s hotlist now. They’ve really stepped up their foil game lately, and it shows! For example, they pay $85 for foil Crop Rotation (a common!) and $105 for foil Timeshifted Gemstone Mine. What blows me away the most, though, is Card Kingdom’s aggressiveness on Unlimited. I see their buy prices fluctuate constantly depending on how many they get in stock, but they inevitably sell out every time and the price marches higher. Now they’ve got a buy price of $10,200 for Black Lotus, $2,880 for Mox Jet, $2,400 for Timetwister, and $2,280 for Mox Ruby. These are amazing numbers. The thing that makes Leveler “better” this time (I don’t own any Leveler copies FWIW) is that you don’t need any further cards to win with the combo, whereas with Lab Man you needed it to survive (it’s easier to kill creatures than Planeswalkers) and a way to draw a card. With Jace you would immediately use his +1 ability to draw a card, and then immediately win with his static ability. EMA Crypt has the modern card frame, some (perhaps larger proportion of the buyers market) have a preference for the modern frame. The liquidity of the EMA version is probably higher than the Promo version. Also the proportion of the EMA versions in NM condition is probably higher. All these factors probably contribute to CK having the relative difference in price on Mana Crypt versions. Mainly, higher liquidity Mover 2x EMA versions with a margin of $65 is probably easier than moving one Promo version with $100 margin. ABUgames – They are probably pretty happy to recycle the Beta Mana Flare, the ~$200 profit to you is just cash flow. The $400 modern cards you get are likely only costing them ~$200 to buy. From their perspective they are probably making a small margin perhaps 2% to 5% over the entire transaction. If they do that all day long they are happy as Larry.